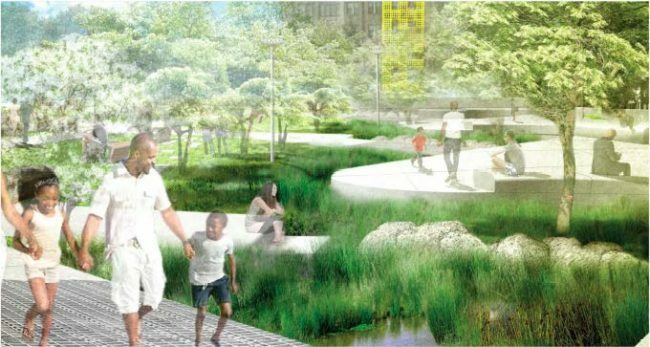 See artist Walter Hood's final design for Nauck Town Square here. The Town Square project is being developed as the anchor for the Nauck Village Center, in parallel with the Four Mile Run Valley initiative. The Square will take up the entire block (between 24th Road South and South Shirlington Road). It will serve as a community gathering place for events and learning about the neighborhood’s rich cultural heritage as expressed through design enhancements and public art by award-winning landscape architect and artist Walter Hood. The County Board adopted the Nauck Village Center Action Plan (NVCAP) on July 10, 2004, to guide public and private investment of the neighborhood’s commercial center. Settled by free African-Americans in 1844, the Nauck neighborhood is one of Arlington’s oldest African-American communities. The Board also designated the Shirlington Road Corridor as a Special Revitalization District (SRD), which allows properties within the plan’s boundaries to receive special incentives and regulations. Arlington County’s Neighborhood Services Division is managing the project in partnership with the Department of Parks & Recreation and AED-Cultural Affairs. The project is supported in part by an award from the National Endowment for the Arts. Final Design: View Walter Hood's May 7, 2018 presentation on the final design for Nauck Town Square here.